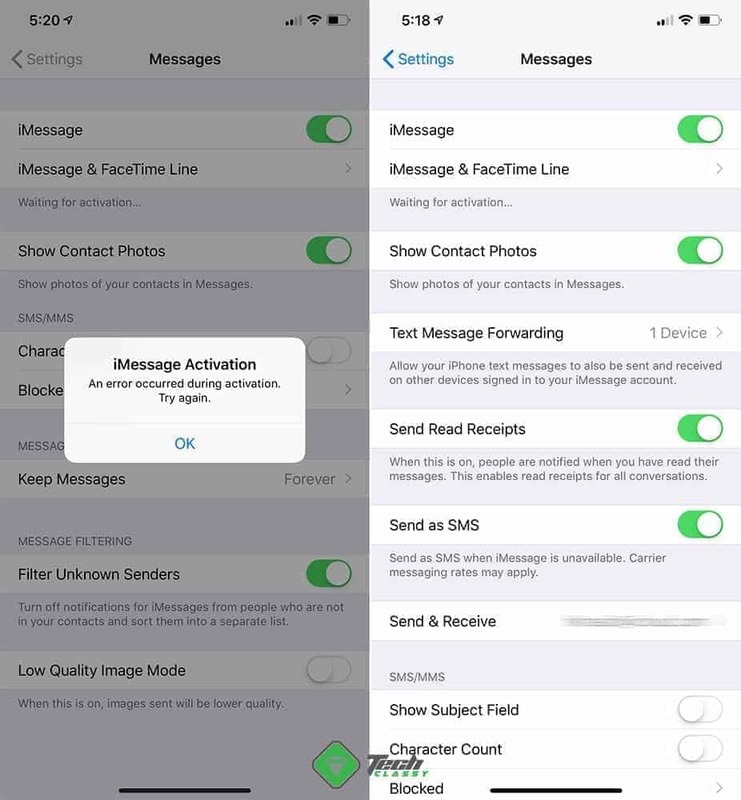 If you are an iPhone or iPad user, probably, you have been looking for a solution to fix iMessage and FaceTime waiting for activation error. Yes, You are in the right place. iMessage is a reason many people stick with iPhone. Because it gives you the feel of native text messaging but it’s not. It has many cool features like other modern messenger services and the exclusive Animoji. On the other hand, FaceTime is a great VOIP calling feature which is like a native phone call. But, It’s not. All iPhone and iPad users have these features built-in. It means any iOS device users can text or call another iPhone/iPad users for free through the internet. But, Sometimes, Users may encounter problems with it. The most common with iMessage and also FaceTime is “Waiting for activation” error. Generally, Users should get these services activated within a few moments after setting up an Apple iOS device. But, Sometimes, It may be stuck at the pending stage. In some cases, It comes with the following error message. An error occurred during activation. So, What’s now? Don’t worry, you always can get rid of this problem. If already have been encountering this problem, you are in the right place. There may be various reasons behind this type of issues. It usually happens with a new iPhone. Or after replacing SIM card on your iPhone. Sometimes, It may be an issue with your carrier. But, Following these methods may resolve iMessage waiting for activation error and also the FaceTime. But, Make sure you are connected to a WiFi or cellular network with data enabled. Now, Turn it off by the toggle button. Then, Enable airplane mode and wait for 3/5 minutes. At last, Disable airplane mode and enable iMessage and FaceTime again. In some cases, It really helps to troubleshoot this type of problems. Sometimes, The old number may remain as your FaceTime number on your phone. In this case, You can replace it with your new one. It might help in activating iMessage. Now, Tap on iMessage and FaceTime Line. Usually, It the waiting for activation error happens right after inserting a new SIM card on your existing Apple iPhone. You may try many things. But, It will still show you the problem. Because your carrier has to know that you are using an iPhone. In this case, Do the following things. At first, Enable Data connection. Now, Make a phone call and talk for a minute. Also do some text messaging. Now, Restart the iMessage and FaceTime. It should work within a few moments. Note: This is the method that worked for me. I had encountered this problem after inserting a new SIM card in my iPhone XS Max. Because I was using another SIM for a few months before. Right after inserting the new one, the iPhone was still showing the old cell number with loading/pending animation. At last, I did the same thing as this method 2. I was lucky enough that it fixed my problem. To troubleshoot iMessage waiting for activation error, you may have to re-insert the SIM card and restart your iPhone/iPad. Because it works in many situations. If you have prepaid sim, you should have balance in your phone. Otherwise, You may not be able to fix this problem. At first, Go to Settings > General > Reset. Now, Tap on “Reset Network Settings” and give your passcode. If you encounter iMessage or FaceTime waiting for activation or any other similar error, Apple suggests to wait for at least 24 hours. Because, Sometimes, It may take that long time to get everything ready for you. If all of the methods failed, you may try to reset your iPhone or iPad. But, Before that, Take backup all of your data. Then, Go to Settings > General > Reset All Settings. Done. If all of these methods fail, you should contact your cellular provider. They may give you an acceptable explanation. Also, You should contact Apple support or post on their community forum to get help from experts. These are the methods to fix iMessage and FaceTime waiting for activation error. You may have a better suggestion. So, You can let it know everyone by posting a comment below with details.